With award season coming up for Hockey East, this semester’s Boston Hockey Blog writers, Matt and Liam, made their picks for Player of the Year, Rookie of the Year, Coach of the Year, Goaltender of the year and the most memorable moment of the season. Hockey East will announce its award Thursday night. Gaudette is the best player on the best team and in the conference. He leads the country in goals (30) and points (59). If it weren’t for his linemate, senior forward Dylan Sikura, he would have led the conference in assists. There’s a good chance that the first line center for Northeastern will also be the school’s first Hobey Baker recipient. Sensing a theme here? You will see a lot of Northeastern players in Matt’s award selections. Although I seriously thought about Boston University’s freshman forward Shane Bowers for this award. Primeau’s .933 goal save percentage and his 1.86 goals against average had him second in the country among rookie goaltenders in both categories. At times it felt like Primeau was a brick wall and took over the games. If the Montreal Canadiens view Primeau as the successor to Carey Price, Primeau should be on Huntington Avenue for awhile as Price is only 30 years old. Tkachuk was elite all season for the Terriers, setting a physical tone for the team on its top line of forwards for much of the year. BU’s improvement over the final two months of the regular season was directly correlated to Tkachuk’s uptick in production. Over the final 16 games leading into the Hockey East semifinals, Tkachuk notched at least one point for 12 straight matchups. He also tied for third in scoring among all Hockey East freshmen with 28 points. Carvel’s team was predicted to finish last in the conference, but played in a quarterfinal matchup against Northeastern. This was the first time Carvel had his team in the quarterfinals since 2012 while coaching a team of predominantly freshmen players. After hoisting the Beanpot trophy three times as a player with the Huskies, Madigan guided Northeastern to its first Beanpot win since 1988 this February. He has developed forwards such as Dylan Sikura and Adam Gaudette into two of the best scorers in the country, has brought along a freshman goaltender, Cayden Primeau, into being a reliable rock in net and has his squad prepped for a deep NCAA tournament run. Primeau leads Hockey East in every major goaltending category. I don’t think this is much of a question. Hernberg has been as reliable as they come for the River Hawks despite not having the type of defensive line in front of him that Primeau does with the Huskies. He ranks second in the Hockey East in both save percentage (.921) and goals allowed per game (2.08). BU beats Harvard in double overtime in the Beanpot opening round. Beanpot final. Seeing Northeastern’s players and fans’ ecstasy after winning the tournament for the first time in 30 seasons is a moment that will go down in Boston hockey lore. 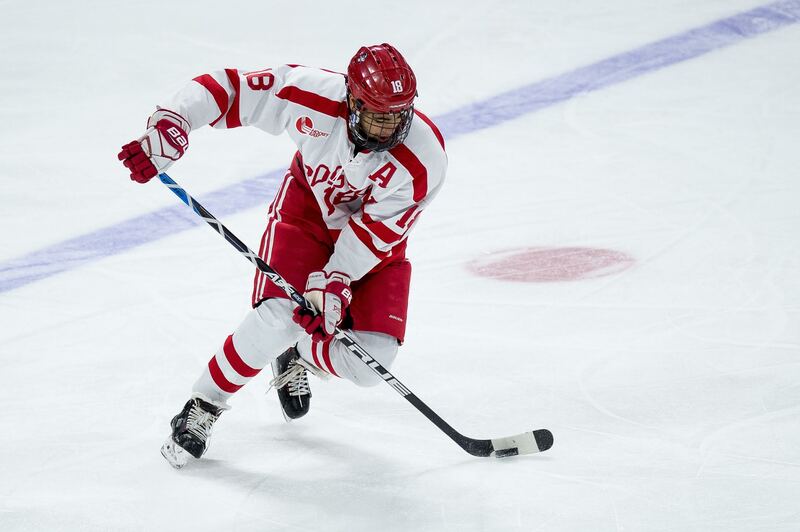 The Boston University men’s hockey team secured its first win of 2018 last night against the University of New Hampshire. In an early 5 p.m. start tonight at Agganis Arena, the Terriers will look to continue their success against No. 11 Providence College in the two teams’ third meeting of the 2017-18 season. Read this week’s preview here and follow along on tonight’s live blog. Although the Boston University men’s hockey team will not return to action until the first weekend of the new year, some Terriers will be wearing the jersey of their respective country over the break. Freshman forward Brady Tkachuk, sophomores goaltender Jake Oettinger and forward Patrick Harper will represent Team USA in the World Junior Championship which begins play Tuesday, Dec. 26. Harper leads BU with 21 points, tied for first in assists with 13 and tied for second in goals with 8. Tkachuk leads Terrier freshmen in points and assists with 14 and 10 respectively Oettinger has started 17 games for BU and has a .902 save percentage. Both Harper and Oettinger skated on the gold medal-winning 2017 U.S. National Junior Team that bested Team Canada 5-4 in a shootout. Skating for Team Canada is sophomore defenseman Dante Fabbro. Fabbro leads the Terriers with 40 blocked shots and he has 12 points. Fabbro represented Canada in last year’s tournament–in which he took home a silver medal. Playing for Finland is freshman defenseman Kasper Kotkansalo. Kotkansalo has two goals and three assists on the season. These will not be the only Terriers playing in international tournaments over their break. Senior defenseman and captain Brandon Hickey was selected to represent team Canada in the Spengler Cup. Hickey has three goals and two assists for the Terriers. The Boston University men’s hockey team finished 2017 with two matchups against the University of Massachusetts Lowell. This was the first time the two teams had faced each other unranked since Dec. 7, 2007. 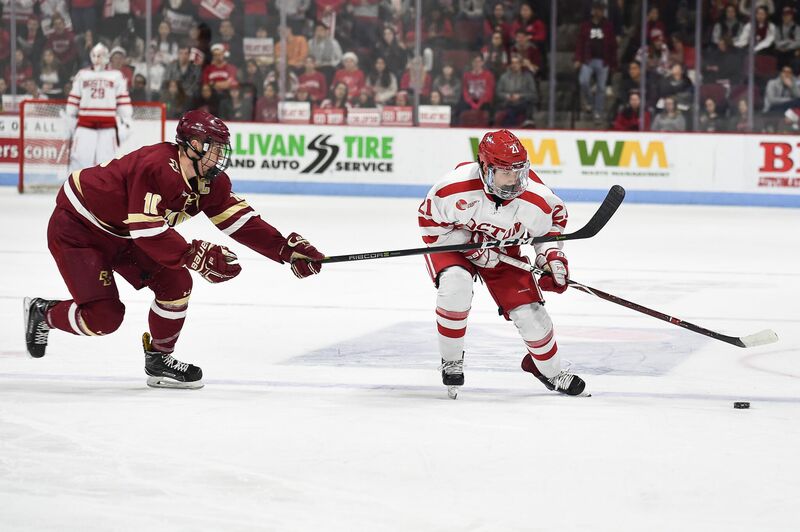 Friday night at Tsongas Center, the Terriers had a 2-1 lead going into the final period of the game after freshman forward Brady Tkachuk and graduate transfer forward Drew Melanson struck less than a minute into the first and second period respectively. However, BU couldn’t maintain the lead as the River Hawks found the back of the net twice in the third and the Terriers couldn’t get the puck past Lowell junior goaltender Christoffer Hernberg. Saturday ensued much differently. BU notched three goals in each period for a 9-3 win to end the semester. Junior forward Jordan Greenway tallied a hat-trick, which included a short-handed goal. Sophomore forward Patrick Harper scored twice on the power play, freshman defenseman Cam Crotty got his first collegiate goal and sophomore defenseman Chad Krys notched a goal the following shift after being hit hard in the leg by a shot from River Hawks senior defenseman Chris Forney. While the Terriers will go into the winter break on a high note and the team appears optimistic about the next half of their season, the Lowell series continued to highlight an ever so familiar sequence of events. Over BU’s past three Hockey East series, the squad has been limited to two goals or less on one night then puts up seven or more goals the next. This was seen specifically in the Terriers’ splits with the University of Maine, then-No. 15 Boston College and this past weekend. BU is currently tied for No. 3 in the conference with No. 9 Providence College and in the upcoming half of the season, it will face many opponents again and play Hockey East series against Merrimack College, the University of Massachusetts Amherst and the University of Vermont. This latter portion of the season will certainly provide a challenge to the Terriers who have proven they can play against a top team like BC, but they have yet to see a full sweep and take home four points. BU’s next game will be an exhibition game against the United States National Team Development Program on Jan. 5 where many of the Terriers will see their former teammates. Following that game will be another matchup against Maine at Agganis Arena. Another note before the articles and media below: I (Nikki) will be assuming the role of the sports editor of The Daily Free Press during the spring semester so Liam O’Brien and Matt Martin will be the main writers for men’s hockey and the Boston Hockey Blog. I may come back to cover a couple games, but I’d like to thank everyone for a great semester, hanging in with us through the technical difficulties and keeping along with the blog. What are you thoughts on the Lowell series and the first half of the 2017-18 season? 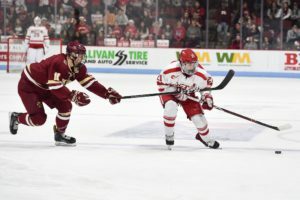 The Boston University men’s hockey team will faceoff against the University of Massachusetts Lowell tonight at Agganis Arena. The puck drop is set for 7 p.m. and will mark the Terriers’ last game of 2017. Last night at the Tsongas Center, BU fell 3-2 to Lowell after relinquishing its 2-1 lead in the third period, but graduate transfer forward Drew Melanson notched his first goal as a Terrier. In case you missed it, here is this week’s preview and follow along on tonight’s live blog below. The Boston University men’s hockey team will take on the University of Massachusetts Lowell tonight at 7:15 in the Tsongas Center. Read this week’s preview here and follow along on tonight’s live blog. The United States, Canada and Finland 2018 IIHF World Junior Championship preliminary rosters were announced earlier this week. Five players from the Boston University men’s hockey team – some returning and some new – saw their names on the rosters among many other young hockey players who hope to represent their home countries in Buffalo, New York from Dec. 26 to Jan. 5. Last year, Team USA won its fourth title after beating Team Canada 5-4 in a shootout. Below are the five Terriers that were named to their respective countries’ WJC preliminary rosters. Team USA invited 28 players and will narrow the group down to 23 while Team Canada invited 32 players and will narrow it down to a 22-man roster. Harper notched one goal for Team USA last year and currently leads BU with 19 points (6g, 13a). Last Friday, Harper assisted four of the Terriers’ goals in the team’s 7-4 win over then-No. 15 Boston College. Fabbro took home a silver medal with Team Canada last year and was one of two collegiate players on the squad. The New Westminster, British Columbia native currently has 11 points (4g, 7a) and leads BU in blocked shots with 38. While Tyler Parsons and BC sophomore goaltender Joseph Woll played in the net during last year’s championships, Oettinger came home with a gold medal. This year, Woll and Maine’s freshman goaltender Jeremy Swayman were also named to the preliminary roster. The Lakeville, Minnesota native currently sits on a .905 goal save percentage and 2.89 goals against average over 15 games. “It’s awesome and I’ve been lucky enough to do it a couple of times and it never gets old. [There’s] a really good group of guys invited to that camp so really excited to reconnect with those guys and start trying to defend our gold medal from last year, but that’s all going to come after what should be a strong end of the season here at BU.” – Oettinger after practice on Thursday. The Finnish defenseman has represented Team Finland on many occasions including winning a gold medal in the IIHF World Under-18 World Championship. Kotkansalo currently leads BU’s freshman defensemen in blocked shots with 23, and has one goal and three assists on the season. Tkachuk won gold with Team USA in the 2017 U18 World Championship and collected seven points (1g, 6a) on top of serving as captain. The St. Louis, Missouri native is currently fifth highest on the team in points with 12 (2g, 10a) and leads in plus minus rating of +9. Krys was named to USA’s preliminary roster last year, but didn’t make the final cut. Last season, the defenseman finished a solid season with 11 points (5g, 6a) after being linemates with current Bruins defenseman Charlie McAvoy. Krys has surpassed that with 14 points (4g, 10a) over 17 games this season. “Yeah, obviously you feel like it’s one of your children so you’re always hopeful and you always think very highly of him. It’s disappointing for Chad, but the one thing I know that he and I’ve talked about is you just move past it and he gets to spend Christmas at home and get some time off. There’s always a silver lining to everything.” – BU head coach David Quinn after practice on Thursday. What are your thoughts on the BU players chosen for the WJC preliminary rosters? 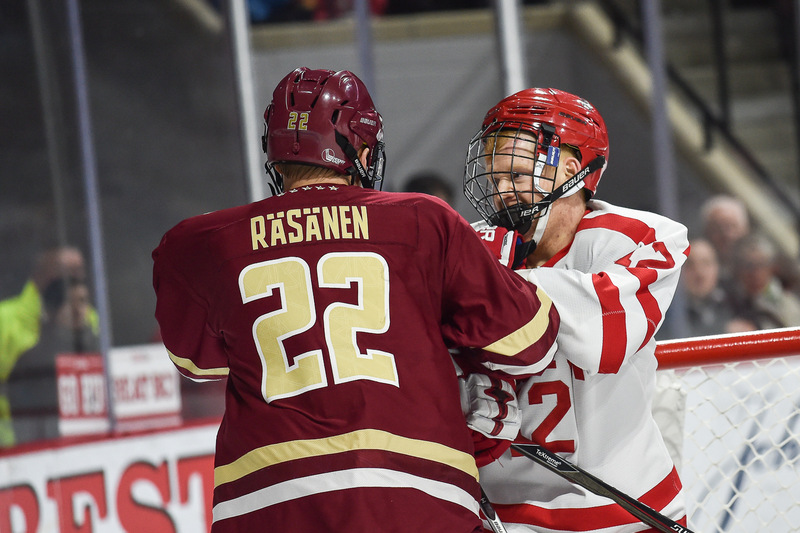 The Boston University men’s hockey team faced off in the 275th and 276th editions of the Battle of Comm. Ave. on Friday and Saturday night respectively. The Terriers emerged with a split after both teams found success on the other’s home ice. On Friday, BU found itself in an early 2-0 deficit after the Eagles scored two goals minutes into the contest. However, the Terriers came back with three goals in the first period, including a short-handed bid by freshman forward Brady Tkachuk. BU didn’t stop there as it netted four more goals to cap the 7-4 win. Saturday night started similarly with BC getting on the board twice without response from the Terriers. Freshman forward Shane Bowers scored BU’s lone tally of the night, but the Eagles found the back of the net once again to put the Terriers in another two-goal deficit, one they would not come back from in the eventual 4-1 loss. BU will finish off 2017 with a home-and-home series against the No. 18 University of Massachusetts Lowell. 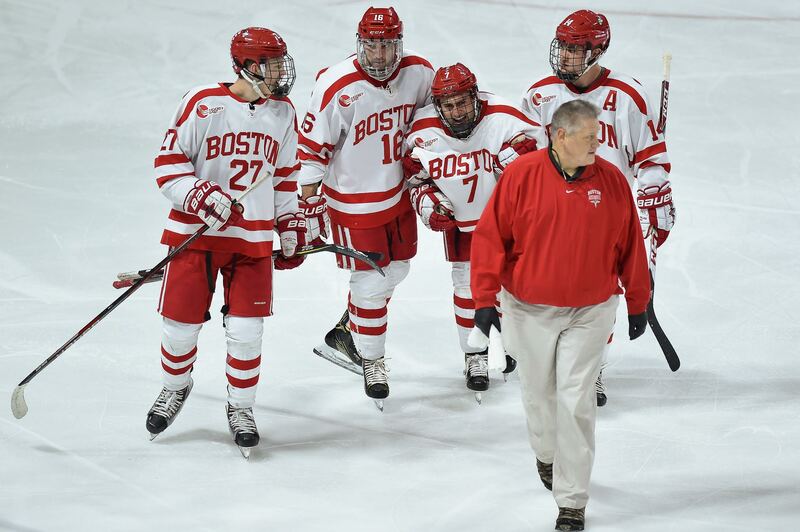 The Boston University men’s hockey team will take on No. 15 Boston College tonight at Agganis Arena for the final game of its Hockey East home-and-home series. Last night at Conte Forum, the Terriers came out with a 7-4 win after coming back from an 2-0 deficit in the first minutes of the game. Follow along on tonight’s live blog below.